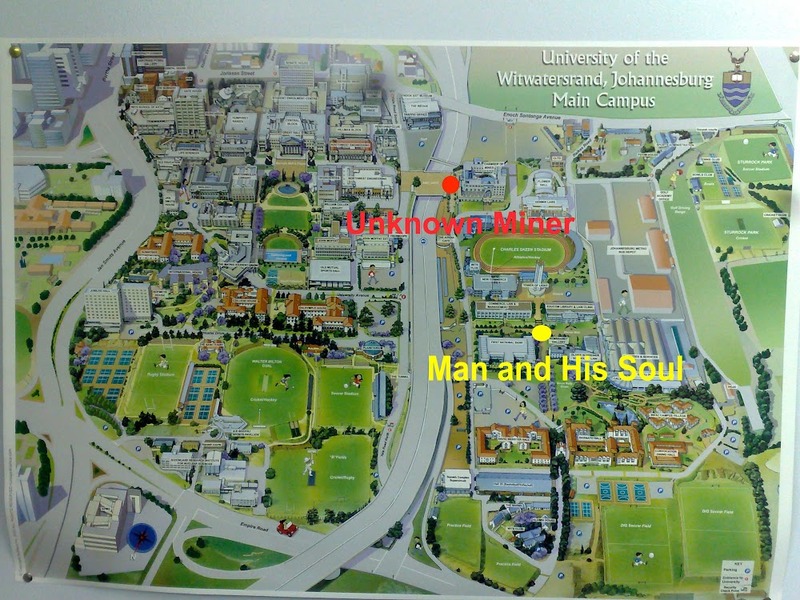 The 'Man and his Soul' project began at the University of the Witwatersrand (Wits) in April 2010. A group responsible for West Campus art headed by Prof. Kathy Munro was introduced to the work of Herman Wald by West Campus Art curator Natalie Knight. Many of the artist's works were designed as maquettes or models to be expanded for commissions. 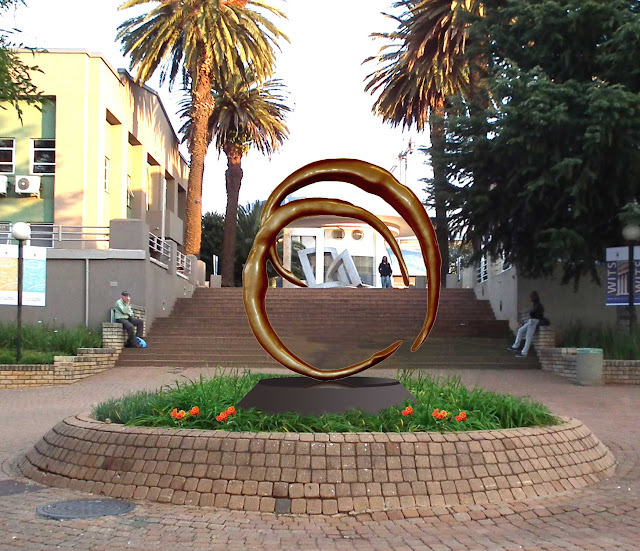 The 50cm high maquette of Man and his Soul evoked a strong and positive response from university staff at the outset. The theme of the work also matched the location well. The interface between man and soul mirrored the junction between the two paths; in similar vein the links between the square shapes of the Concatenation sculpture in the background will be viewed through the circular 'frame' created by the newly installed work. Discussions then proceeded and agreement finally reached on how we could produce the work 2.5m high. The commision was finally placed by the by the Commerce Law and Management Faculty. The photoshop mockup on the right was used to visualize the end result. First the maquette (shown above) was laser scanned to make a computer model. The model (see image above) was then used by a milling machine (CNC) to carve the work out in foam. The image below on the left shows what looks like a drill bit removing the excess foam material. The image below on the right shows the partially completed foam assembly. The foam was then given a Plaster of Paris skin to produce the scaled up original. 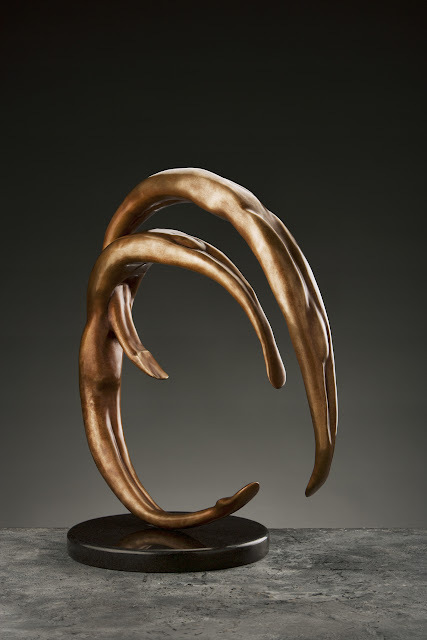 The bronze casting process then proceeded as per normal. This was challenging - the scanning and milling phases had to be repeated to achieve the required quality. Louis and Michael Wald committed much time to getting the best possible result. The images below show the work at the end of the casting phase. The one on the left prior to patination and the one on the right after. The bronze shells are reinforced with 3 dimentional trusses for additional strength the design of which was no simple matter either.